A Voce is one of my favorite places in a neighborhood filled with a high concentration of great restaurants. It is one of the best places to enjoy true lunch (not just brunch) in mid-town on Sundays, and also happens to be very child-friendly. The dining room is striking in its airy, spare elegance. The spectacular views of Columbus Circle are equaled only by those of A Voce’s upstairs neighbor, Per Se. Executive Chef Missy Robbins has a unique take on Italian cuisine. Her food is hearty, rustic and utterly delicious, although I confess I am happiest here with the simpler dishes. Wine Director Olivier Flosse oversees an extensive wine list whose main flaw is its sheer size, but there are plenty of well-priced choices, even if they take a little work to find. Tenuta dell’Ornellaia’s flagship Merlot Masseto was the focus on this night. I was quite excited to revisit these wines, as I had tasted every vintage of Masseto roughly one year prior in the only complete vertical of that wine ever held in the United States. Although the food was terrific, on this night the focus was very much on the wines. The evening started with the 2008 Masseto, a wine that only continues to improve in bottle. The 2008 has always had structure to burn, but over the last year the fruit has begun to emerge, making for a vibrant, powerful Masseto built for the cellar. 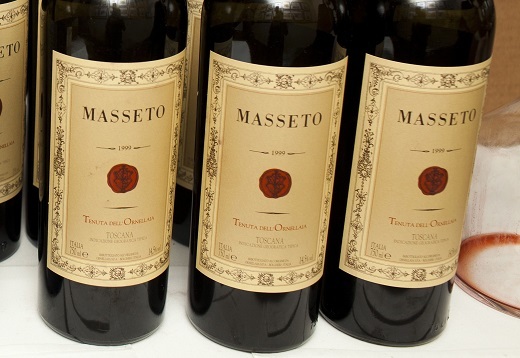 The immediate, voluptuous personality of the 2007 Masseto was on full display. Round, seamless and totally beautiful, the 2007 stood out for its balance and overall harmony. In my opinion, the 2006 Masseto is the greatest ever made, and this tasting confirmed the wine’s justly deserved reputation as an icon. With absolutely nothing out of place, the 2006 came across as rich, dense and totally beautiful, The 2006 is essentially a combination of 2007 and 2008, with a little more elegance added in for good measure. What a wine! In this flight, the 2005 Masseto was the weakest on paper, but it showed beautifully. Silky, elegant and totally impeccable, the 2005 gave the attendees a master class on understated greatness. The 2002 Masseto, tasted in the second flight, was one of the revelations of the night. It was absolutely sublime, proving that talented winemakers can make great wines even in the most challenging of vintages with impeccable work in the vineyard and uncompromising selection in the cellar. Readers who took the plunge on the 2002 will be rewarded with an absolutely sublime, perfumed, polished wine of the highest level. Once again, I preferred the 2002 Masseto to the 2003, a wine that showed all of the excess weight, heaviness and opulence of the torrid vintage. Elegance and silkiness remain the hallmarks of the 2004 Masseto, and those qualities came through in spades on this night. The 2004 isn’t huge like the 2001 and 2006, but rather it is a wine that continues to impresses for its pure length, finesse and sheer classiness. On this night, it was truly exceptional. The 2001’s reputation as one of the great all-time Massetos was easy to see. The wine boasted superb power, depth and concentration, not to mention superb overall balance. I was thrilled to finally taste a good bottle of the 2000 Masseto after having quite a bit of bad luck. The 2000 won’t set the world on fire, but the best bottles are quite harmonious, and even better, they won’t require the cellaring needed age more recent vintages. The 1999 Masseto was just as I remembered, which is to say huge, powerful and structured. Unlike the 2000, the 1999 is headed for a long life of fabulous drinking.